We know it’s been far TOO long since our last post (more than 2 months? really?) but Kickstarter and Steam Greenlight campaigns are so intense… that we needed to sort LOTS of things out! I guess you all will excuse us… as things can’t go better: as you all might know…“Dead Synchronicity: Tomorrow comes Today” was funded on Kickstarter! In fact, it was 114% funded, more than $51,000!!! 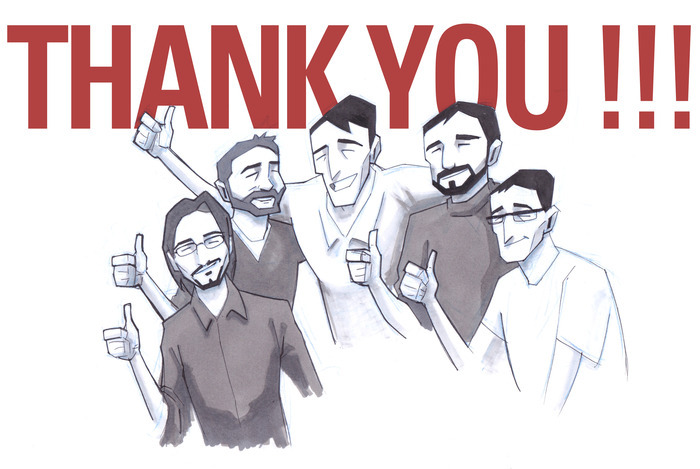 So, we want to thank, once more, everyone who supported us: backers, media, people spreading the word… Without you, the campaign wouldn’t have succeeded. As simple as that. Furthermore, a few days after the Kickstarter campaign was over… the game was greenlit, which means “Dead Synchronicity: Tomorrow comes Today” will be featured on Steam once it’s released! Again… just because of your support! Such great news will allow us to face the rest of the development… with a smile on our faces, that we want to share with you! THANKS!